MANHATTAN — Police have released a chilling surveillance video of the brutal and alleged hate crime attack on Damian Furtch outside a West Village McDonalds. The video shows two men attacking Furtch on the northeast corner of West 3rd and Sixth Avenue, police said. One of the men is seen punching Furtch so hard that he stumbles several feet into the street, towards an oncoming car. He hits Furtch again and then the second man follows Furtch off screen, where the victim was hit once more in the head. Furtch sustained two black eyes and lacerations to his nose and eye that required stitches. 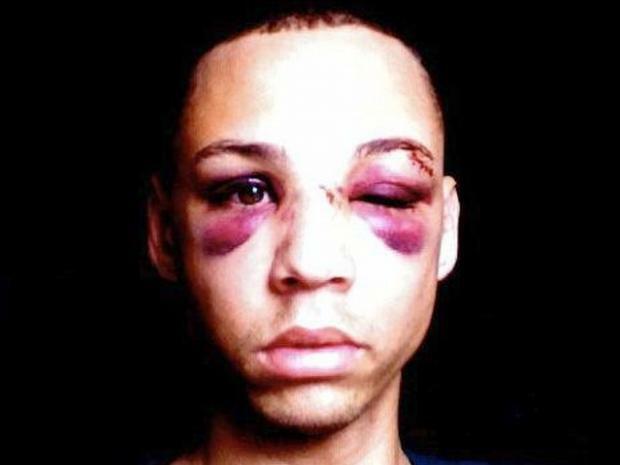 Furtch told officials that his attackers started harassing him about his pink clothes and called him a "f----ing f---gg-t" during the assault, and the case is being investigated by the NYPD's Hate Crimes Task Force. In an interview with NY1, Furtch said the altercation started inside the McDonalds on West 3rd Street when the men, accompanied by two women, started mocking him about his outfit — a pink belt and pink shoelaces that he wears for his job a the Pink Tea Cup restaurant on Bleecker Street. Furtch said that he walked out of the McDonalds to diffuse the tension and make a phone call. 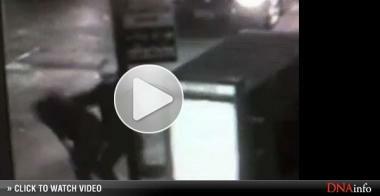 But the two men followed him outside and began beating him. After the attack, Furtch was taken to Roosevelt Hospital, police said. "I try very hard to stay true to who I am and who I want to be," Furtch told NY1. The aspiring dancer and model added that any attempt to prevent someone from being who they are is "sad." Police described the suspected attackers as Hispanic men between the ages of 18 and 20 years old. One of the men is believed to be approximately 5'8, 150 lbs. with a tattoo of a cross on his left cheekbone. One of the men appeared to be wearing a white hat during the attack.